In 1863 the authorities send Irish orphans Ismay and Mara to Australia against their will. Worse, on arrival they're separated from one another. While Ismay is forced to take a job as a maid, miles away in the country, Mara must stay in the care of the catholic mission. Desperate to be reunited, they both run away but Ismay soon runs into danger out in the bush. She is saved by Malachi Firth, but although he's attracted to her, he doesn't want to be encumbered with a wife. Meanwhile, their elder sister Keara has not forgotten them. However, she has had her own struggles to face and by the time she reaches Melbourne she finds that the trail is cold. Danger continues to threaten all three sisters. Will they ever find one another again? 5.0 out of 5 starsYou cannot put this book down! I loved this book, second in this series. A beautiful insight into families through the lives of 3 Irish sisters. I loved each of them. Anna Jacobs plot was full of twists and unexpressed turns that made you eager for the next page or chapter. One thing about her books is there are never dull or boring parts to wade through. Every page is interesting or exciting. Highly recommend this series. This book is historical romantic fiction but also very much a thriller. Twopenny Rainbows by Anna Jacobs is one of those rare feel-good stories that can hold a readers attention from the first page to the last. It's a gentle, gritty, engaging tale with a little something for everyone to find and treasure. It's also the second book in a three part series titled The Irish Sisters. I loved it. I loved all three books. For this one, another five stars. 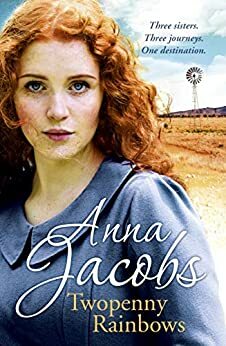 4.0 out of 5 starsA refreshing read by Anna Jacobs. Enjoyed it very much. a good follow up to A Penny worth of sunshine. Anna Jacobs brings her characters to life in a refreshing way. One can feel their emotions, pain and hardship. But they are not all doom and gloom either. Am hooked on her as an author now. I would search the world to be reunited with my sisters also. I love them dearly. So blessed are we. Recommend this book to anyone who has a sister or would dearly love one. I never seem to get sick of books written by Anna Jacobs. She makes her characters come alive and also has a wonderful story line. From the very first page I am right in there. The plot was good, and you wanted to keep on turnig the pages. A thorough good read highly recommend it. I buy books on Amazon for a friend who doesn't like the computer, but she is a voracious reader. She adores this author & has had me buy ALL her books. She is delighted! I love Anna Jacob's stories. She seems to relate good plots and finalises her characters very nicely.